We had the pleasure of spending Chinese New Year's Eve in Chengdu. 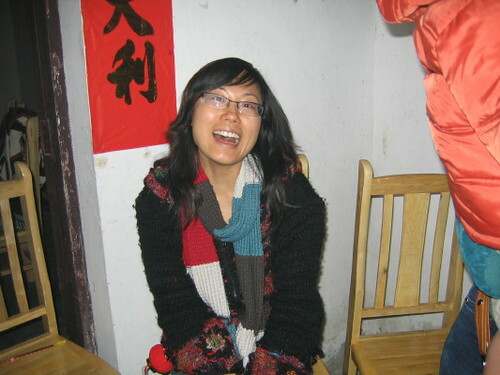 My friend Yong organized an afternoon and evening at her restaurant The Farm House" just outside of Chengdu. 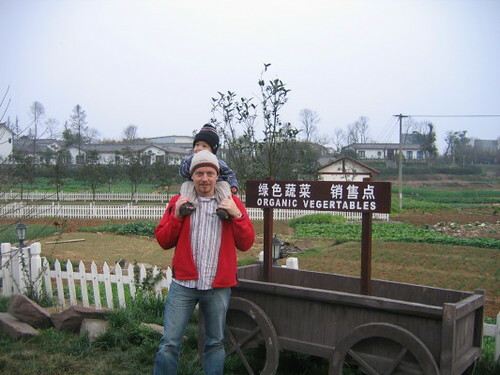 It is really nice and there are a lot of vegetable farms. On Yong's property they farm organic vegetable. We thought this sign was funny. Yong had lots of yummy Chinese food prepared for the day. She also had 3 goats and a couple chickens that she had barbequed on a spit. 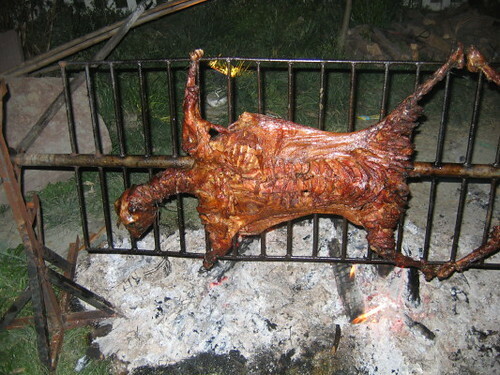 Here is a picture of one of the goats on the spit. 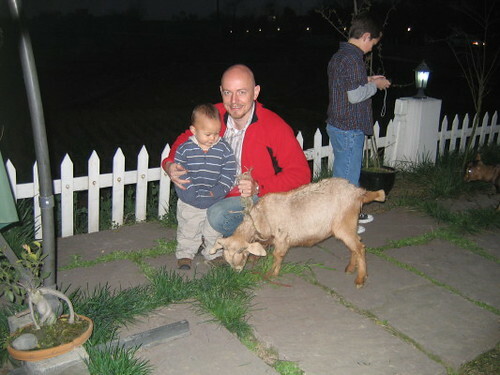 After I saw the 3 goats on the spit we had a couple live goats as visitors to our party. Jonny said he thought that these goats were also going to be dinner, but I didn't believe him. 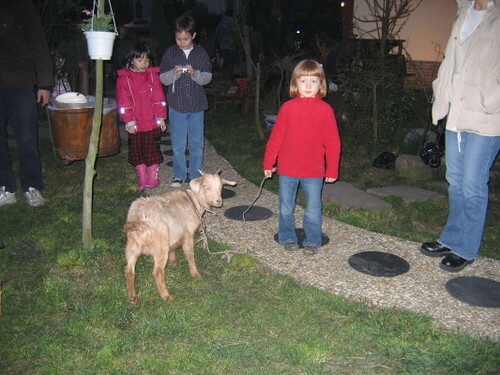 I couldn't see how the kids could be playing with the goats one minute and then take them to slaughter the next. Fortunately, these goats didn't get eaten, but I did ask Yong about it later. She told me that they were going to be butchered if we needed the extra meat, but we didn't. She also told me that Chinese people like to see that their meat is fresh and don't mind seeing the animal being killed in front of them. I don't think I could have eaten the goat if I saw it being slaughtered, but I can see their point. When the sun went down and everyone was eating and drinking the fireworks began. It was absolutely amazing! I have never seen fireworks like these before! They were non-stop and probably didn't stop until 4 a.m. the next morning! I kept trying to take some photos of the spectacular show, but I think I need a tripod or a special camera to actually take good nighttime pictures. Here is one I thought turned out pretty good! After Yong's party we had promised Xiao Yang and Da Yang that we would stop by their house for to let off some of our fireworks we bought earlier in the day. We brought a few of our friends with us and let off quite a few fireworks. I really couldn't believe the fireworks you could buy here. There were things that you would only see let off by pyrotechnic professionals in the U.S., but anyone could purchase these explosives here. Here is a few of us getting ready to fire off our explosives! 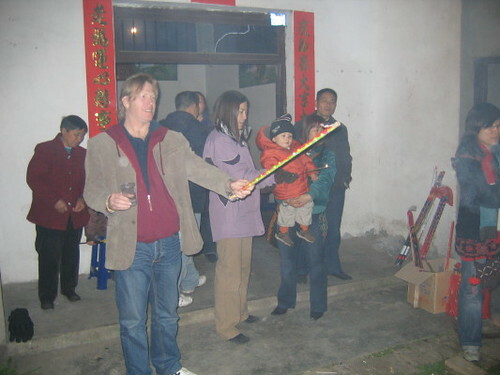 Angus and Xiao Yang getting ready to light a sparkler. The fireworks were just amazing! I just couldn't believe the skies were just filled with them from the time the sun went down to probably 4 a.m. We returned home around midnight and everyone had told us that was when the show would really start. Jonny went to the roof patio outside our bedroom and shot a few videos of the show. It sounded like a war zone, but sure enough I was asleep in no time and sleep through all of the noise. Enjoy! well how do you spell "vegertables"? Wow. 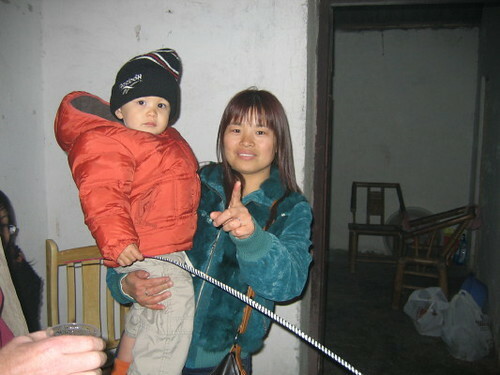 I hope we'll be as successful at making friends in Taiwan as you have been in Chengdu. 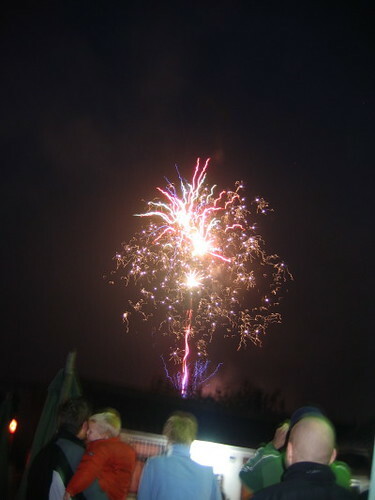 Dutch New Years was quite an experience too: the fireworks only went on for about 45 minutes (starting at midnight) but people were setting them off *everywhere* and they were the kind you'd have to go to a park to see an expert set off in the US. Funny, because the Dutch are very safety conscious in other ways. Oh, and in case you didn't get my email a while ago, it's dichroic at riseagain dot net.